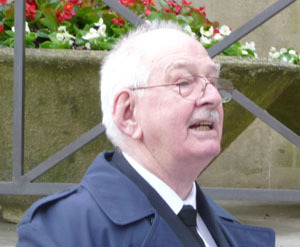 This Sunday was the 67th anniversary of the Second Raid on Bath. 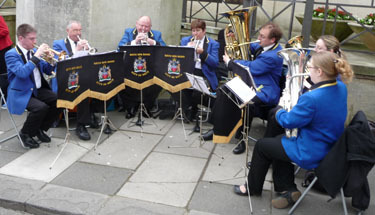 This year we had the Bath Spa Band join us, providing music before and after the event. Harry Hemming welcomed everybody to this year's event. Each year we try to feature a different part of the city and this year we are featuring memories of the Weston and Newbridge areas. Kay Barrett recites a poem. Kay recited "The Bombed City" by Charles Whitby. After delivering a prayer of remembrance, a prayer for peace and the Prayer of St Francis, Edgar Evans invited all assembled to join him in the Lord's Prayer. Harry Hemming read two memories. 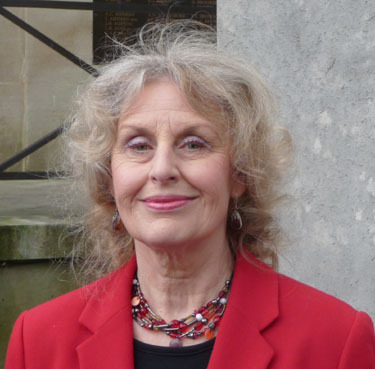 Annette's memories were already on this website and can be read here. Geoffrey's story was provided in response to a press appeal for memories, and has now been added to the website. Laying the Wreath, by Fleur Horstmann-Bliss. Fleur laid the wreath in memory of her relatives, Percival and Elsie Horstmann and their son Terence, who were killed when their home in Newbridge Hill received a direct hit during the second raid. 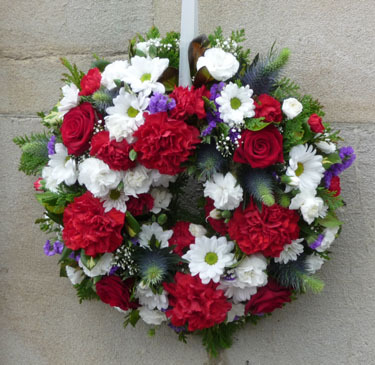 The Wreath, donated by Jonquil. Many thanks to Jonquil the florist in High Street, Weston for their kind donation. The Bath Spa band closed this years event. Nobody remains, but we will meet here again next year, on 25th April 2010 at 3 pm. Click here for information about the plans for the 2010 ceremony. 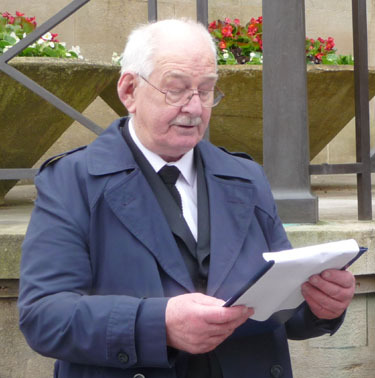 The victims of the Bath Blitz were remembered in a memorial ceremony on Sunday. 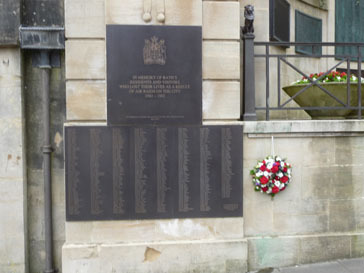 On two nights in April 1942, German planes bombed Bath, killing 417 people. It has been said Hitler was so angry at the raids on Germany that he picked up the Baedeker guide book and picked out Britain's most beautiful cities for reprisal bombing - and Bath was one of those. 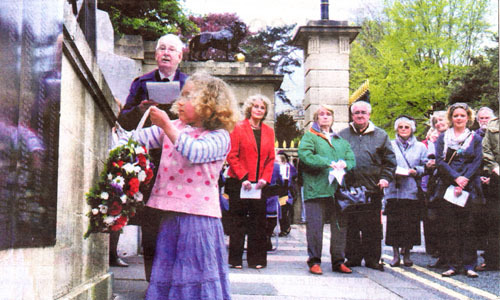 Every year people gather at the war memorial in Royal Victoria Park to remember those killed, and a descendant of somebody on the memorial is invited to lay a wreath. This year, memories from the Weston and Newbridge areas were featured, including the story of the Horstmann family. 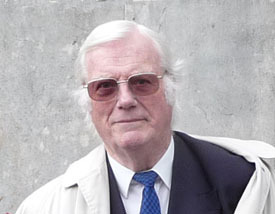 Percival Horstmann was the director of an industrial company. During the Blitz he was killed, along with his wife Elsie and son Terence, in a direct hit on their Newbridge Hill house. 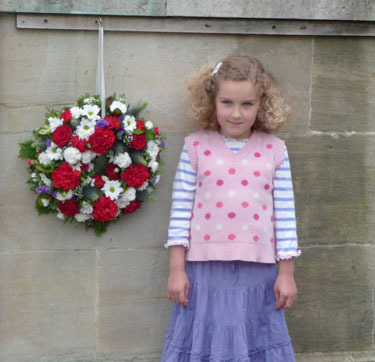 Representing the family was Fleur Horstmann-Bliss, seven, who laid the memorial wreath. Kathryn Barrett recited a poem called The Bombed City while Harry Hemming told stories about the raids. 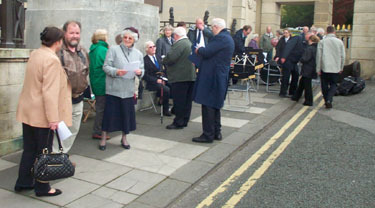 Prayers were led by Edgar Evans, followed by a minute's silence. Exceptionally this year, a concert was held later in the afternoon. 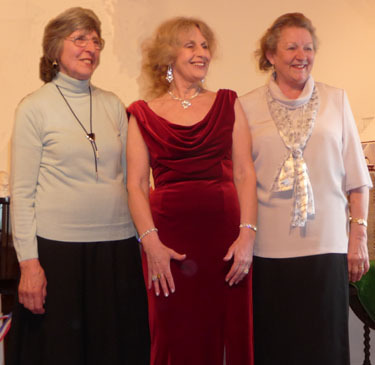 The three ladies pictured from the Combe Music & Concert Club (from left to right: Diane Gibb, Principal Singer, Kathryn Barrett, Spoken Word and novelty items and Helen Timmis, Piano) gave an afternoon of entertainment with a wartime theme, including music, songs, poetry, impressions and a sing-along. All this was followed by refreshments, including some wonderful home-made cakes. The wartime theme was a on-off special in aid of Project funds but the Concert Club has other events (including different performers) scheduled for 20th May and 1st July in aid of the local charity Supporting Disabled in Need. Details of these events and any arranged at future dates can be obtained by telephone - Bath 830288.